List building is an ongoing aspect of email marketing. Even the biggest and baddest of marketers are constantly on the prowl in attempt to grow their audience. Building a list may seem like a full time job at times, but it doesn’t have to be when you have access to the right tools. Here is an overview of how Benchmark Email makes it easy to add new users and customers to your mailing lists. Benchmark Email provides several methods of uploading your email contacts. You can add individual contacts one at a time, copy and paste your contacts and, best of all, import contacts from a file. You can upload fiiles in .xls, .csv and .txt formats. But that’s not all. We also provide a plethora of email integrations that allow you to pull your contact lists from Salesforce, Gmail, Google Docs, Hotmail, Zendesk, Zoho and Highrise CRM. Adding to your lists is now simple and convenient thanks to our list upload features. Simply choose your source and import it - and we’re always adding new integrations, so watch this space! There are many ways to build an email list, and using your website is one of the best. Whether you are aiming to sell or inform, a site that generates traffic is a fantastic medium for getting the subscriptions necessary to grow your audience. In order to obtain these subscriptions, you need people to hand over their contact information, and this makes having an opt-in form a necessity. Why go through the hassle of creating your own from scratch when you can just use our custom signup forms? Not only does the Benchmark Email signup form provide a convenient way to obtain new subscribers, it also takes the names and email addresses of those contacts and automatically adds them to your list, sparing you from having to go back and add them later. But you can also build your list with custom signup forms on multiple platforms. Benchmark offers unique plugins for both Facebook and WordPress! Facebook is the biggest thing in social media and arguably one of the most powerful forces in the internet universe. With nearly 700 million users, it is no wonder why this site is targeted by businesses big and small. If you currently have or aspire to establish a Facebook presence, you will be happy to know that our Facebook signup form can also be placed on your profile or fan page. Engage users with social media and dramatically boost your email subscriptions. 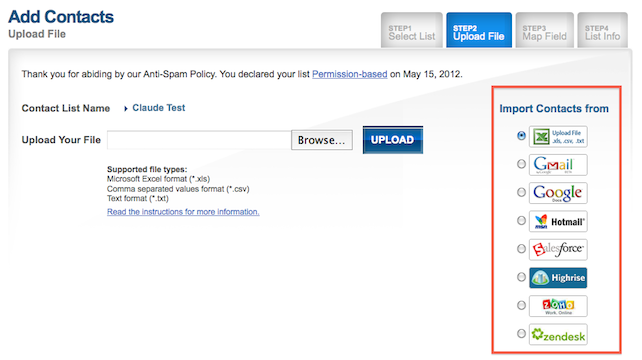 Meanwhile, our WordPress plugin just underwent its latest update and has currently reached over 12,000 downloads. This robust widget gives major email marketing oomph to your WordPress blog, building your list of subscribers with the customizable signup form; sending test emails as well as formatted email versions of your blogs to subscribers; generating live reports with real-time metrics and graphs; and controlling up to 5 separate Benchmark Email accounts - all from right inside your WordPress dashboard. Not too shabby, eh? Benchmark Email’s Easy List Desktop App is the perfect way to make new subscriptions interactive and fun. Install this app on your laptop and take it wherever you go: checkout counters, marketing events, tradeshows, points of sale. 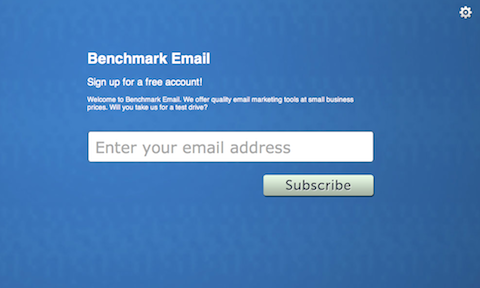 Users can sign up for the email list of your choice and be uploaded directly to your Benchmark account. You can use the double opt-in option for ultra-secure confirmations. The simple design makes the whole process easy and, most importantly, fun. There are 22 textured wallpapers to make the screens pop and...are you ready for this? An iPad version is currently in development and will be available later this year. Your email lists are the foundation of your email marketing, and Benchmark Email is always striving to make the list building process easier, safer and in line with best email marketing practices. Enjoy these great tools and look forward to even more in the months to come! Re: Benchmark Easy List Desktop App Article This article is very deceptive. You claim to be adding people to my email lists - but you are asking people to sign up for Benchmark accounts. Shame on you!